Uzma Bozai - For Rangers with Uzma Bozai & The London Chatter. We are absolutely delighted to collaborate with Fashion and Lifestyle blogger Kelly Eastwood from The London Chatter on our Africa Collection. We are donating 10% of the RRP from each Africa Collection sweatshirt sold from our to For Rangers, a dedicated group of individuals who are raising money for the welfare of rangers who risk their lives daily to protect Africa’s endangered species. This charity is also supported by Kelly Eastwood aka The London Chatter, who continues to inspire us, not just in all things fashion, but to share the message about conservation and the amazing work that For Rangers are doing – we caught up with Kelly to learn more about blogging, fashion and her involvement in conservation. Tell us a little about how you started working to help promote For Rangers and why it is an organisation that means so much to you? I am friends with the founders of For Rangers, who help protect Africa’s endangered wildlife outside of their full time jobs, and out of pure passion. The more I learn’t about the importance of rangers, who’s important, and frequently dangerous roles are overlooked, the more I wanted to help raise some awareness and funds for them. The 10% you donate when buying an Uzma Bozai sweatshirt is an amazing way to support them in the vital work they do. How has being a blogger given you the opportunity to support causes which are close to your heart? I feel really privileged to be in the position I’m in, where I can use my influence for good, by drawing attention to important causes like For Rangers. My seven piece, Masai inspired collection of bracelets with Auree Jewellery sees 100% OF the profits go to For Rangers. Please tell us, what is the greatest satisfaction of being a fashion blogger…? I’ve always been a supporter of new and young British designers and being able to help them along their journey brings all the feels. We love scrolling through your Instagram feed – your outfits and photos are so full of colour and positivity– what inspires your styling? Travel is inspires me a lot, and I love the bold and colourful prints I find around the world. I recently went to Copenhagen Fashion Week which totally inspired me by not only with what I saw on the runway, but also with what I saw off the runway. The Scandi bloggers have a joyful nonchalance, and they all cycles to and from the shows, so many of them were wearing big old trainers with their glittery socks and summer dresses. Their style definitely encouraged my more relaxed approach to dressing for London Fashion Week. Fashion is such a great way of expressing yourself, what do you think your personal style says about you? I have a very classically eclectic approach to the way I dress, so there is always an element of fun and I’m never too far away from a wee bit of leopard print. You can take the girl outta Africa…! When you can’t decide what to wear, what is your ‘go to’ outfit? I usually just throw on a jumpsuit or some dungarees, so I have to think less about it when in a rush, and can make it mainly about the accessories and lipstick. As the weather turns colder, would you give us a few tips on how to make a winter wardrobe stand out from the rest? Definitely invest in a great pair of boots. Polo necks and tights are also a great way to turn your favourite summer looks into winter friendly outfits. Do you have any styling tips for our UB girls on how to dress up/down their favorite sweatshirt – which one is your favorite? People imagine you can only wear a sweatshirt casually with jeans. The Uzma Bozai Africa sweatshirts, with their intricate detailing, are perfect to wear with a midi skirt and heels or leather trousers. My favourite piece is the Smile sweatshirt, from the Africa collection, and the 10% donation to For Rangers from each sale definitely makes me smile. 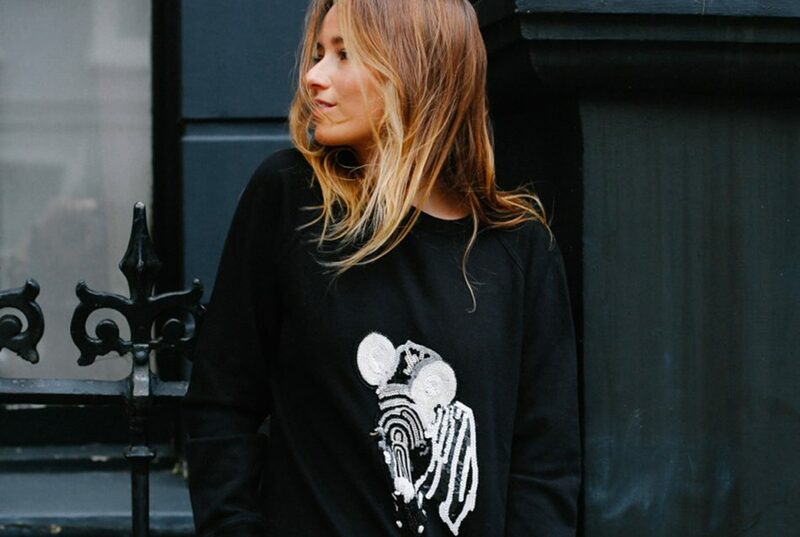 See how Kelly styles her edit from the Africa Collection sweatshirts here. To shop our Africa Collection, click here!